Available from 2020, John Deere’s 2750 PrecisionCut and E-Cut hybrid triplex mowers offer more precise control of performance and cut quality than ever before, atlower operating costs. Designed to provide premium cut quality regardless of who operates the machine, the new 2750 greens mowers feature an enhanced TechControl system as well as improved access to the grass boxes, together with a lightweight, open platform design. Using the proven, password protected TechControl system, fleet managers and technicians can input commands, controlling nearly everything relating to the operator’s performance. This includes frequency of clip, turn speed, clean-up pass speed and how fast the cutting units raise and lower, providing consistent end results on the course whoever is operating the mower. Featured as an industry exclusive on the hydraulic model for the first time (and also available as standard on the hybrid unit), the frequency of clip can be programmed by altering parameters on mowing speed, reel speed and number of blades on the reel. Once programmed, the settings cannot be changed by the operator and automatically adjust with ground speed, ensuring uniformity from machine to machine. 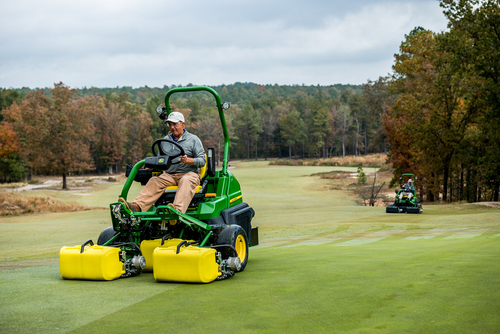 Clean-up pass mode, another John Deere exclusive, is a preset operating mode that the operator can engage to automatically reduce mowing speed on perimeter passes to increase accuracy, with less scalping or missed strips. This setting allows the operator to focus on the task, rather than on manually feathering the speed. Adjustable turn speed allows the course manager to control how fast the operator is able to turn, which minimises the risk of turf damage. In addition, by selecting Eco Mode, engine speed can be electronically controlled to conserve fuel. In this mode, engine RPM are automatically adjusted based on the load, which can save up to 30 per cent on fuel and reduce operating sound levels. The 2750 greens mowers’ frame design provides a low centre of gravity for excellent stability and traction performance. The lighter weight also reduces tyre tracking and ground compaction, while the open platform makes it easier to access the central grass box. All three grass boxes can be easily removed and installed with one hand, and there is a translucent yellow option for better visibility of grass clippings levels. John Deere’s new 2750 PrecisionCut and E-Cut hybrid triplex mowers offer a 62in (157cm) mowing width at speeds of up to 6mph (9.7kph). The three-axis lift system on the cutting units provides up to 18 degrees of steering and 42 degrees of contour following for an even cut, especially on clean-up passes and undulating terrain. For maximum operator comfort, both the steering column and the steering wheel can be easily adjusted without the need for tools.